Click for full map PDF. View the treatment area in ArcGIS here. Spot-treating along the shoreline wherever milfoil breaks the surface. This week marks the second phase of Milfoil treatment on Hayden Lake for 2018. Beginning July 25, the shoreline of the lake will receive spot-treatments. AquaTechnex, contracted by ISDA to implement the procedure, will apply the herbicide Littora only where Milfoil is breaking – or about to break – the surface of the water, 0-20 feet from shore. It won’t be applied uniformly across the area. If the light-seeking tendrils of Milfoil are well-below the surface, or if the mass of Milfoil is free-floating and not rooted to the bottom, the location won’t receive treatment. 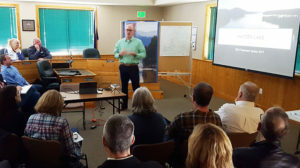 Treatment to those areas would not impact Milfoil growth, would impose unnecessary exposure to the chemicals, and would be a wasteful use of resources. Just enough herbicide. Play it safe with maximum water use restrictions. In the spot-treated areas, the rate of herbicide application is expected to be well below the 2 gallons per acre of the first phase of treatment that took place on or about July 11. This decision arises from ISDA’s intent to use just the right amount of chemicals to do the job – no more and no less. 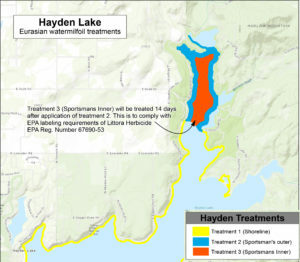 Kim Holzer, the ISDA agent giving her all for Hayden Lake, said that the actual application rate will be determined on the day of treatment, depending on the visibility of the Milfoil. 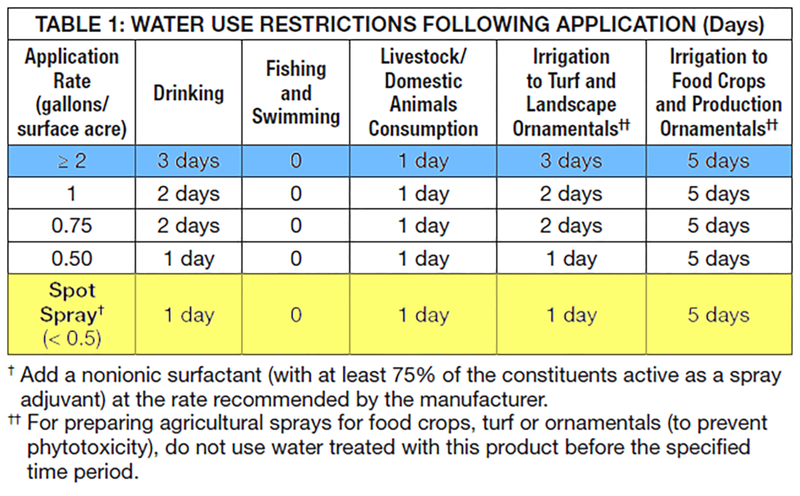 A lower application rate would result in a lower concentration of chemicals and would carry fewer water use restrictions, as we note in Table 1, snipped from the Littora label. Even though Kim is optimistic that the rate will be low, she advises that it is safest to follow the guidelines set forth for higher concentrations and restrict water use for three days or until Aqua Technex or ISDA gives affected property owners an all-clear notice. Sportsmans’ Access receiving full treatment. The shoreline of Sportsman’s Access will undergo treatment this week as well, and it necessitates a more aggressive treatment approach. This popular bay on the north end of the lake is experiencing very dense and rapid expansion of Milfoil, as the conditions there are ripe for its growth. The application along the bay’s shoreline will be comprehensive and at a rate of 2 gallons per acre. 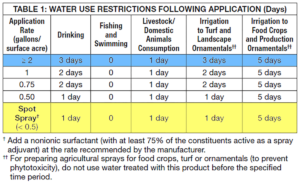 This rate will necessitate the more extended water use restrictions: three days for drinking and irrigation, one day for livestock and domestic animal use, and as always, no restrictions on fishing or swimming. ISDA and Aqua Technex are bringing all of their expertise to bear, for the benefit of our beautiful Hayden Lake, and we are grateful. Hop on over to AquaTechnex’s Hayden Lake Milfoil BLOG for some interesting tidbits on herbicide application and keep an eye on them for application details.